Riverdale’s most famous redhead, Archie Andrews, will meet his demise in an upcoming issue this July. 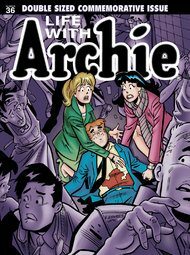 According to CNN, Archie Comics plans a bloody conclusion to its Life with Archie series, which imagines possible future scenarios for the eternal teenager, including marriages to Betty and Veronica. The death doesn’t affect the original Archie series, which has been running since 1941.